HFM, the Company offering the only street-legal self-driving shuttle vehicle is joining forces with one of the leaders in the field of electric in-wheel motors - Elaphe Propulsion Technologies Ltd. Elaphe in-wheel motors will power HFM's revolutionary Motionboard® intelligent vehicle platform. LAS VEGAS and HOLM, Germany and LJUBLJANA, Slovenia, Jan. 18, 2019 /PRNewswire/ -- Hanseatische Fahrzeug Manufaktur GmbH (HFM), a global company specializing in the development of highly complex mechatronics systems for electric and autonomous vehicles, is joining forces with Elaphe, the leading company in the area of in-wheel motor technology. Elaphe in-wheel motors will provide the propulsion in HFM's Motionboard, a highly adaptable autonomous electric vehicle platform and the only one with a permit to operate on public roads. "To us, Elaphe is a perfect fit. Elaphe's expertise and production competence in the area of in-wheel motor technology makes them the ideal partner for developing solutions for a sustainable and autonomous mobility of tomorrow," says Dipl. Kfm. Wolfgang Bern, Managing Director of HFM. "In addition, the company also has very extensive testing facilities to put the motors through their paces." 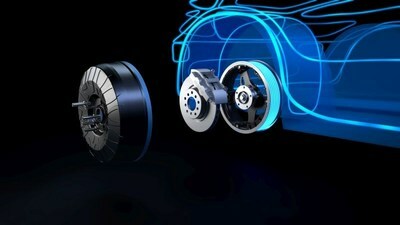 "Our in-wheel technology is put through extensive automotive validation under a wide range of demanding operating conditions and loads" explains Urska Skrt, Head of Business Development at Elaphe, and adds: "Elaphe's patented electromagnetic topology allows our motor design to be highly scalable, light-weight and the most compact on the market. Combined with intelligent motor control, it is the most simple and modular electric vehicle propulsion that enables ultimate packaging and user-centered design." HFM's scalable and modular Motionboard® platform allows adapting the vehicle built on top of the platform to its current needs, both in terms of length and width as well as with regard to the battery capacity, making it extremely modular and widely applicable. What sets the Motionboard® platform clearly apart from all others is that it meets the requirements for homologation in Europe as an M1 class vehicle (vehicles for passenger transport with a maximum of eight seats plus the driver). "As a company focusing on compliance with all the requirements for type approval and homologation within the framework of existing and future legal provisions, reliability and safety are of course at the top of our list of priorities," says Friedrich Soost, Head of Mechanical Development at HFM and responsible for the mechanical integration of the Elaphe in-wheel motors into the Motionboard platform. "Elaphe's state-of-the-art manufacturing technologies, extensive testing and quality control ensure that the in-wheel motors perform to our high standards in both regards." 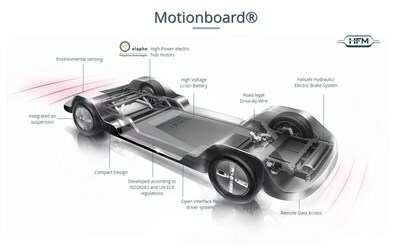 The flexibility of HFM's Motionboard platform requires the motors to cover a wide range of potential uses with significant differences in vehicle mass. In addition to delivering the necessary torque, the motors also have to be highly efficient to make maximum use of the installed battery capacity. "Elaphe's in-wheel motors operate at over 90 percent efficiency and allow us to achieve extended operating ranges," says Marcus v. Wilamowitz, Head of Electrical Integration and Functional Safety at HFM. "In addition to avoiding all the complications and unnecessary losses in gears and transmission, the distributed direct-drive with intelligent multiple-wheel control helps introduce new safety features and improves performance of traction and braking." adds Gorazd Lampič, the CEO of Elaphe. "I am delighted that more and more leading companies in the field of sustainable and autonomous mobility are deciding to work with HFM, because we are the only ones able to offer an autonomous street-legal shuttle vehicle based on the Motionboard," says Bern. "I am looking forward to the cooperation with Elaphe and the fruits to be reaped from it in the years to come." About Elaphe Propulsion Technologies Ltd.
Elaphe Propulsion Technologies Ltd. is a leading EU-based developer and manufacturer of disruptive in-wheel electric propulsion systems for electric and hybrid vehicles. The company provides customized and OEM-ready in-wheel powertrain solutions for a wide range of vehicles. The Elaphe in-wheel powertrain platform includes motors, power electronics and intelligent multiple-motor propulsion control. The company presents the ultimate platform for the future of electric vehicles. Elaphe's experience in in-wheel technology spans over two decades, and its achievements include the world's highest-performance in-wheel-powered applications to date. Patented and innovative electromagnetic and mechanical designs for in-wheel propulsion enable Elaphe™ products to boast market-leading specific torque, compact design and use of standard brake and bearings for in-wheel propulsion systems. The Elaphe distributed propulsion architecture is the ultimate propulsion platform for connected and automated vehicles, bringing new opportunities to mobility and transportation. For more information, please visit www.in-wheel.com. Hanseatische Fahrzeug Manufaktur (HFM) GmbH was established as a company in 2010. Located in Holm, Germany, in the vicinity of Hamburg, HFM took on the challenge of creating a sustainable future mobility. HFM specializes in the development of highly complex mechatronics systems for electric and autonomous vehicles. HFM focuses not only on the technical feasibility, but also on compliance with all the requirements for type approval and homologation within the framework of existing and future legal provisions. For more information, please visit www.motionboard.de.